Pupils and teachers at Richmount Primary School, Portadown are leading the way for a sustainable future in Northern Ireland! Richmount Primary School has installed a 5kWp solar photovoltaic (PV) system on its roof to help generate clean, environmentally friendly electricity from the sun and to help reduce the school’s energy bills. 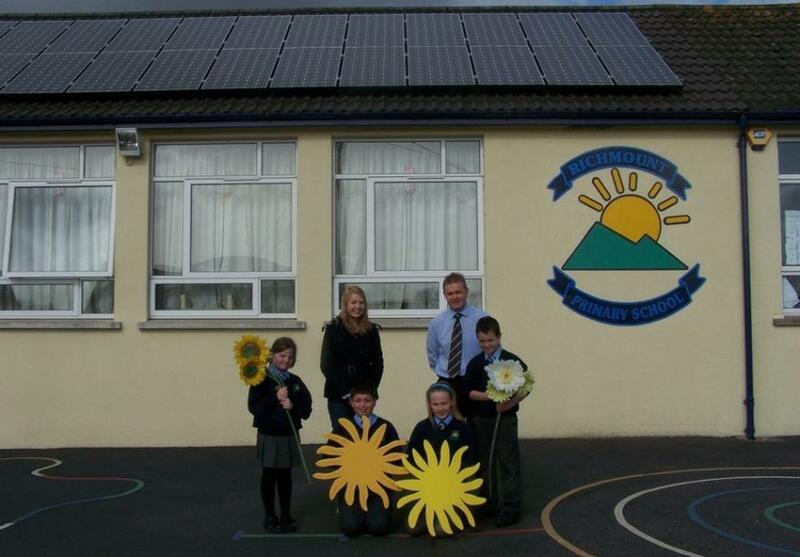 The solar panels have been funded by the Low Carbon Buildings Programme Phase 2, the Northern Ireland Electricity SMART programme and the school. Mr Hall, Principal of Richmount Primary School, says installing the solar panels was an opportunity not only to save on energy costs but also to educate the pupils about their ongoing responsibilities to the environment. “We are an Eco School so we are constantly looking at new measures we could introduce to help protect the local environment. The installation of solar panels at the school is a constant reminder to the pupils, teachers and parents that we can all play a part in protecting our future and we really appreciate the support from NIE and the Low Carbon Buildings Programme. Our school is south facing so solar panels seemed to be the most ideal sustainable energy source for us. The electronic display in the school highlights the amount of electricity being generated and the amount of CO2, providing an excellent learning tool for the pupils.” The panels will produce over 3,000 units of renewable electricity each year, a significant saving on the school’s energy bills. The NIE SMART programme is funded by Northern Ireland Electricity, the network operator, and managed by NIE Energy.